The American people can remain confident in the "soundness and resilience in the American financial system." "Don't Worry, The Banking System Is Sound". In the wake of the Fannie Mae, Freddie Mac, and AIG bailouts, Paulson was flooded with calls. 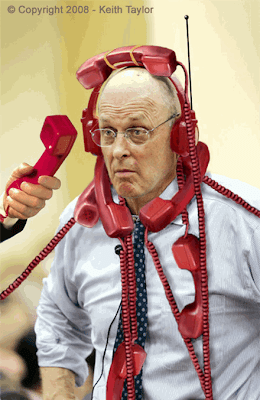 Reporter Keith Taylor captured the following stunning image of Paulson answering questions from China, Japan, German, Australia, New Zealand, Canada, Great Britain, India, France, Sweden, Russia, and Iceland about the soundness of the US banking system. Unfortunately I do not have an audio transcript, but Keith Taylor assures me that Paulson answered every call the same way: "Don't Worry, The Banking System Is Sound". Congratulations to Keith Taylor for solid reporting that the mainstream media somehow missed. Please add the $200 billion taxpayer bailout of Fannie Mae (FNM) and Freddie Mac (FRE) to the list. Also add the $85 billion bailout of insurance company American International Group (AIG). Inquiring minds may also wish to consider other Keith Taylor media scoops such as Men In Green and Fannie Mae Gets Married.